With .Next behind us and all of the announcements have made their impact, we now can take a look at how to extend the Acropolis capabilities to other workloads. One of those obvious workloads is application and desktop virtualization (also referred to as SBC/VDI). We are proud to say that Acropolis and Acropolis Hypervisor were awarded Citrix Ready certification for Citrix XenDesktop and XenApp 7.6. Citrix XenApp and XenDesktop have always worked very well on Nutanix systems running Hyper-V or ESXi with several Citrix Ready certifications. 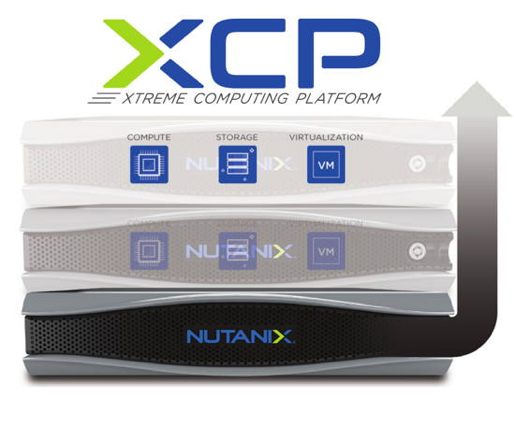 The Aug 12th announcement brings the Nutanix Xtreme Computing Platform running Acropolis Hypervisor into the Citrix Ready family for Citrix XenDesktop/XenApp in addition to the already certified Citrix NetScaler VPX and ShareFile. What is the Nutanix Architecture? The Nutanix Virtual Computing Platform is a scaled-out cluster of high-performance nodes, or servers, each running a standard hypervisor and containing processors, memory, and local storage, consisting of SSD Flash and high capacity SATA disk drives. 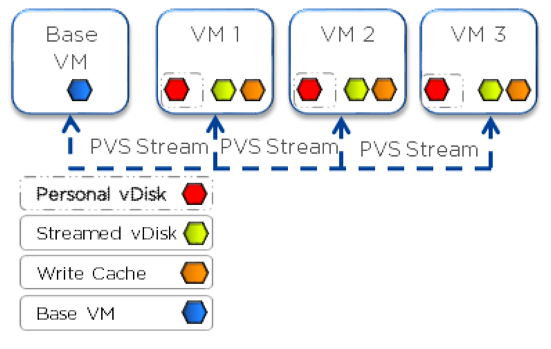 Each node runs virtual machines just like a standard virtual machine host. In addition, the Nutanix Distributed File System (NDFS) virtualizes local storage from all nodes into a unified pool. In effect, NDFS acts like an advanced NAS that uses local SSDs and disks from all nodes to store virtual machine data. Virtual machines running on the cluster write data to NDFS as if they are writing to shared storage. NDFS is VM-centric and provides advanced data management features. It brings data closer to virtual machines by storing the data locally on the system, resulting in higher performance at a lower cost. Nutanix web-scale converged infrastructure can horizontally scale from as few as three nodes to a large number of nodes, enabling organizations to scale their infrastructure as their needs grow. 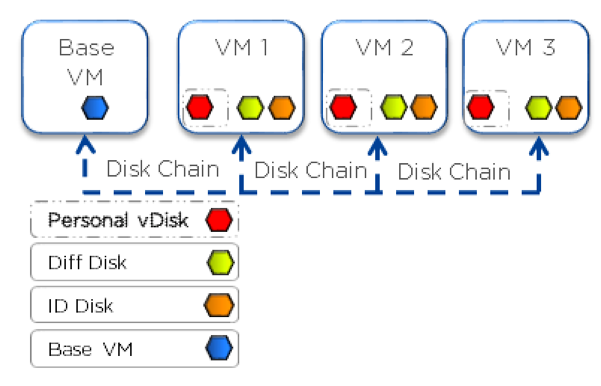 The Nutanix Controller VM and NDFS deliver a unified pool of storage from all nodes across the cluster, using techniques including striping, replication, auto-tiering, error detection, failover, and automatic recovery. This pool is then presented as shared storage resources to Nutanix nodes or hypervisor hosts for seamless support of features, including VM migration, HA, and DRS, along with industry-leading data management features. Additional nodes can be added in a plug-and-play manner in this high-performance scale-out architecture to build a cluster that adapts to meet the needs of the business. The Nutanix Elastic Deduplication Engine is a software-driven, highly scalable, and intelligent data reduction technology. It increases the effective capacity in the disk tier, as well as the RAM and flash cache tiers of the system, by eliminating duplicate data. This substantially increases storage efficiency while improving performance due to larger effective cache capacity in RAM and flash. Deduplication is performed by each node individually in the cluster, allowing for efficient and uniform deduplication at scale. This technology is increasingly effective with full/persistent clones or P2V migrations. The NDFS Shadow Clone feature allows for distributed caching of vDisks or VM data which is in a ‘multi-reader’ scenario. This allows VMs on each node to read the Base VM’s vDisk locally instead of forwarding read requests to a master ‘Base VM’. In the case of VDI, this means the base disk can be cached by each node and all read requests for the base will be served locally. If the Base VM is modified, the Shadow Clones will be dropped and the process will start over. What is Nutanix Acropolis Hypervisor (AHV)? For the first time, infrastructure decisions can be made entirely based on the performance, economics, scalability and resiliency requirements of the application, while allowing workloads to move seamlessly without penalty. Distributed Storage Fabric Enterprise data storage delivered as an on-demand service by employing a highly distributed software architecture. Nutanix eliminates the need for traditional SAN and NAS solutions, and delivers a rich set of VM-centric software-defined services, including snapshots, clones, high availability, disaster recovery, deduplication, compression, erasure coding storage optimization and more. 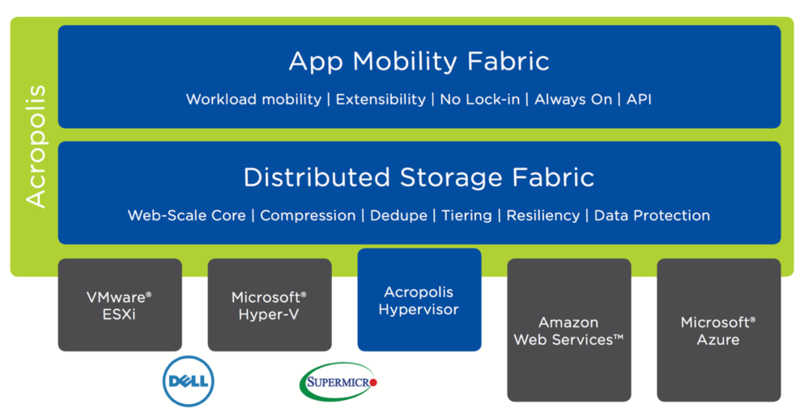 App Mobility Fabric A newly-designed open environment capable of delivering intelligent VM placement, VM migration, and VM conversion across hypervisors and clouds, as well as cross-hypervisor high availability and integrated disaster recovery. Acropolis supports all virtualized applications, and will provide a seamless path to containers and hybrid cloud computing. 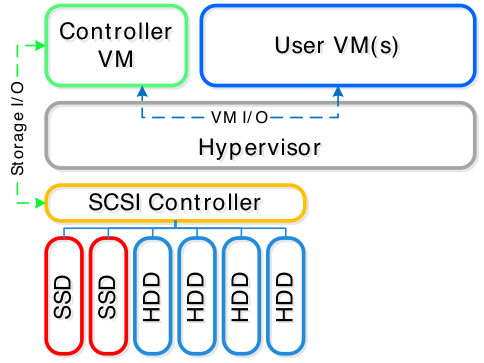 Acropolis Hypervisor While the Distributed Storage Fabric fully supports traditional hypervisors such as VMware® ESXi and Microsoft® Hyper-V, Acropolis also includes a native hypervisor based on the proven Linux KVM hypervisor. With enhanced security, self-healing capabilities based on SaltStack and enterprise-grade VM management, Acropolis Hypervisor delivers the best overall user experience at the lowest TCO and will be the first hypervisor to plug into the App Mobility Fabric. What is the Citrix XenDesktop Architecture? Citrix XenDesktop is a desktop virtualization solution that transforms desktops and applications into a secure, on-demand service available to any user, anywhere, on any device. With XenDesktop, you can deliver individual Windows, web, and SaaS applications, or full virtual desktops, to PCs, Macs, tablets, smartphones, laptops, and thin clients with a high-definition user experience. Citrix XenDesktop provides a complete virtual desktop delivery system by integrating several distributed components with advanced configuration tools that simplify the creation and real-time management of the virtual desktop infrastructure. Desktop Delivery Controller: Installed on servers in the datacenter, the controller authenticates users, manages the assembly of users’ virtual desktop environments, and brokers connections between users and their virtual desktops. It controls the state of the desktops, starting and stopping them based on demand and administrative configuration. The Citrix license needed to run XenDesktop also includes Profile management, in some editions, to manage user personalization settings in virtualized or physical Windows environments. Studio: Citrix Studio is the management console that will allow you to configure and manage your Citrix XenDesktop environment. It will provide different wizard-based deployment or configuration scenarios to publish resources using desktops or applications. 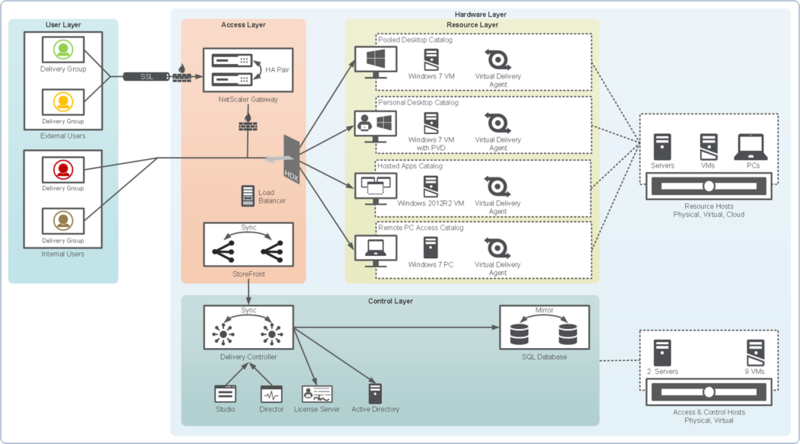 Virtual Desktop Provisioning powered by Citrix Machine Creation Services: Machine Creation Services (MCS) is the building mechanism of the Citrix Desktop Delivery controller that automates and orchestrates the deployment of desktops using a single image. MCS communicates with the orchestration layer of your hypervisor, providing a robust and flexible method of image management. Virtual Desktop Provisioning powered by Citrix Provisioning Services: Provisioning Services (PVS) creates and provisions virtual desktops from a single desktop image on demand, optimizing storage utilization and providing a pristine virtual desktop to each user every time they log on. Desktop provisioning also simplifies desktop images, provides optimal flexibility, and offers fewer points of desktop management for both applications and desktops. Virtual Desktop Agent: Installed on virtual desktops, the agent enables direct FMA (FlexCast Management Architecture) connections between the virtual desktop and user devices. Citrix Receiver: Installed on user devices, the Citrix Desktop Receiver enables direct ICA connections from user devices to virtual desktops. Citrix FlexCast: Citrix XenDesktop with FlexCast delivery technology lets you deliver virtual desktops and applications tailored to meet the diverse performance, security, and flexibility requirements of every worker in your organization through a single solution. Centralized, single-instance management helps you deploy, manage, and secure user desktops more easily and efficiently. Machine Creation Services: Provides images only to desktops virtualized on a hypervisor. The images are contained within the hypervisor pool and then thin-provisioned as needed. The thin-provisioned virtual desktops use identity management functionality to overcome the new security identity (SID) requirements typical with cloning. Machine Creation Services is integrated with and managed by the XenDesktop Controllers and uses the capabilities of the underlying hypervisor. MCS does not require additional servers; it uses integrated functionality built into the hypervisor. As MCS uses hypervisor functionality, it is only a viable option for desktops virtualized on a hypervisor. A master desktop image is created and maintained within the hypervisor pool. The XenDesktop Controller instructs the hypervisor to create a snapshot of the base image and thin-provision new virtual machines through the built-in hypervisor functions. However, thin provisioning images often results in cloning issues as each provisioned desktop has the same identity as the master. MCS uses special functionality within the XenDesktop Controller and XenDesktop Virtual Desktop Agent (installed within the virtual desktop image) to build unique identities for each virtual machine; these identities are stored within the virtual desktop’s identity disk. This functionality allows each virtual desktop to be unique even though it uses the same base image. Provisioning Services streaming technology allows computers to be provisioned and re-provisioned in real-time from a single shared-disk image. Administrators manage all images on the master image instead of managing and patching individual systems. The local hard-disk drive of each system may be used for runtime data caching or, in some scenarios, removed from the system entirely, which reduces power usage, system failure rates, and security risks. Provisioning Services can stream these images to both virtual and physical devices. The Provisioning Services solution’s infrastructure is based on software-streaming technology. After installing and configuring Provisioning Services components, a vDisk is created from a device’s hard drive by taking a snapshot of the OS and application image and then storing that image as a vDisk file on the network. A device that is used during this process is called a Master target device. The devices that use those vDisks are called target devices. vDisks can exist on a Provisioning Server, file share, or, in larger deployments, on a storage system with which the Provisioning Server can communicate (iSCSI, SAN, NAS, and CIFS). vDisks can be assigned to a single target device (Private Image Mode) or to multiple target devices (Standard Image Mode). When a target device is turned on, it is set to start up from the network and to communicate with a Provisioning Server. Unlike thin-client technology, processing takes place on the target device. With the current support from Citrix for XenDesktop on Acropolis Hypervisor we can deploy VMs hosted on Acropolis Hypervisor with the Citrix VDA installed. Combining that with an intelligent script framework based on PowerShell we’re able to deploy VDI or RDSH based VMs that are ready to provide desktops and/or applications to your users. Running Citrix XenDesktop on Nutanix will provide you with a linearly scalable and predictable infrastructure based on a pay-as-you-grow model, while providing the performance that is needed for the mission-critical interface to your enterprise application landscape. For example, if you need to double the number of desktops you support, you can just double your Nutanix infrastructure. Or, if you need to support a few additional users, you can just add the appropriate number of Nutanix hosts determined by our sizer tool adding both memory and compute. The next phase will be to provide an integrated deployment method that will support automated machine catalog management on MCS. Credits for the images regarding the Nutanix infrastructure go to Steven Poitras at The Nutanix Bible. This is the good Blog. A hypervisor manages these virtual machines.